Contact your nearest poison control center in the US or Canada, emergency room, or your physician. When the review copy of this new Timber Press release arrived, I was surprised to see a very familiar-looking book—the size, binding, and cover bear a striking resemblance to Mushrooms of the Pacific Northwest, a book that I know quite well. So what began as Timber Press’s series of field guides for the Pacific Northwest (also including volumes on wildflowers, trees and shrubs, wildlife, and insects) now has expanded to other parts of western North America. Once I began to peruse the contents, it again seemed familiar, but for a different reason. 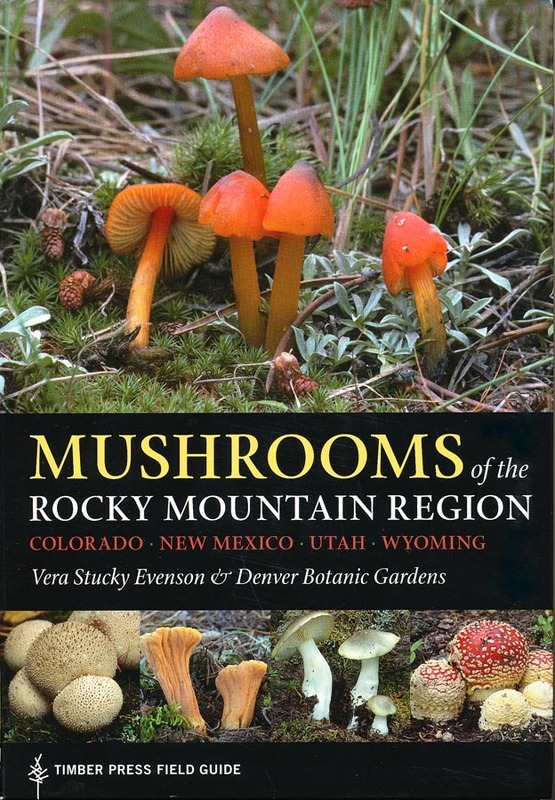 This is a slightly revised and slightly enlarged version of Mushrooms of Colorado and the Southern Rocky Mountains, published by the Denver Botanic Gardens (hence the unusual inclusion of an institution as co-author), Denver Museum of Natural History, and Westcliffe Publishers in 1997 (long-time NAMA members, see review by Dr. Cathy Cripps in the September-October 1997 issue of The Mycophile). Although the format is different, the content of this new version is not much changed from the earlier version. One hundred ninety-two species are described and illustrated, and another 16 are mentioned in comments and illustrated (not sure where the book-jacket claim of “more than 220 species” came from), whereas only about 170 species were covered in the original version. A number of the names have been updated, such as those of the inky caps (formerly all in the genus, Coprinus), Boletus rubriceps—the red-capped Rocky Mountain member of the B. edulis group—and Armillaria solidipes (one of the honey mushrooms, previously known in North America as A. ostoyae; however a few others, such as Turbinellus (Gomphus) floccosus, were missed. Some of the observations sections also have been updated. After a pair of dedications—the 1997 one to Dr. Sam Mitchel, for whom the fungus herbarium at the Denver Botanic Gardens is named, and the 2015 one to Ms. Rosa-Lee Brace, a long-time volunteer and mainstay at the herbarium—and the usual front matter, the introduction includes sections on mushroom anatomy and names, how to use the book, reproduction and lifestyle, habitats and fruiting times, collecting mushrooms, and have fungi, but be careful! An interesting and helpful feature is a list of figures and photographs in which the Botanic Gardens’ accession numbers of the photographed collections are given, so an interested party could find the actual material for further study if desired. The back matter includes a glossary, list of suggested readings, photo and illustration credits and the index. As in the original version, there is a pictorial key to the main morphologic groups inside the front cover and the groups are indicated by color coding at the tops of the pages. Unfortunately, the color codes are not included in the pictorial key, although page numbers for the sections are provided. Further keys to the genera (or “genus and allies”) are provided, but there are no keys to species, which is fine, given the small percentage of the Rocky Mountain mushrooms that are included in the book. Having keys to the species in the book would only result in a large number of false-positive identifications. The species are listed by scientific name, including author. The headings also include brief synonyms, common name (if a widely used one is available), order, family, and a nutshell description. The main descriptive text covers fruiting body (cap, gills, stalk, and flesh, or other characters appropriate to the group being considered), spores, ecology/fruiting pattern, (meaning of the) specific epithet, and observations. Each description is accompanied by a good-to-excellent quality photo of mostly generous size (many are 4-5/8 × 3 inches and a few are even larger). This is a welcome difference from Mushrooms of the Pacific Northwest, where most of the photos were too small to be as effective as they could have been. It’s great that this long out-of-print guide is once again available and it should be an easy purchasing decision for folks who lack the earlier version. For those fortunate enough to have the original, you’ll have to decide whether having an increased number of species (roughly 15%) and a lot of updated names justifies the expense. The North American Mycological Association (NAMA) is a 501(c)(3) nonprofit organization with 80 affiliated clubs and over 1,500 members. NAMA is committed to the promotion of scientific and educational activities related to fungi. NAMA supports the protection of natural areas and their biological integrity. We advocate the sustainable use of mushrooms as a resource and endorse responsible mushroom collecting that does not harm the fungi or their habitats.